When one thinks of the house of Yves Saint Laurent (YSL) very seldom does L’oreal come to mind. However, would it surprise you to know that L’Oreal actually owns YSL? Yes you heard me right. L’Oreal owns YSL and not the other way around. Nonetheless having these two makeup lines being part of the same company does, on occasion come with perks that lie on your lips! When YSL came out in the summer of 2013 with their Rouge Pur Couture Vernis à Lèvres Glossy Stain, (aka lip stain) it literally revolutionized the way lip stain worked. For those who don’t know what lip stain is (because you live in chapstick land), it is like a lip gloss with the staying power of facial primer. When you apply a good lip stain, it should stay in place regardless of eating or drinking for the next 5-7 hours. It cuts down the constant need to reapply lip gloss or lip stick and can endure just about anything you throw at it. However the biggest complain about lip stain in general was that when it started to fade, it looked like a bad stain was left on your lips, left you with a ring around the collar effect and for many made their lips very dry and settled into the fine lines of their mouth. Not attractive at all if you ask me. A few years ago YSL came out with their lip stain and it sent the ladies running to their nearest Sephora to pick one-or two or three-up. Their lip stain was offered in 40 different shades that resembled a beautiful prism of a rainbow. Moreover, the color never travels when eating, drinking, talking or kissing your significant other and doesn't fade uneven. The main deterrent though is that for an attractive 0.20z size bottle, it retails anywhere between $34-$36 dollars. A bit steep for many if you ask me, but this is where L’Oreal comes in. 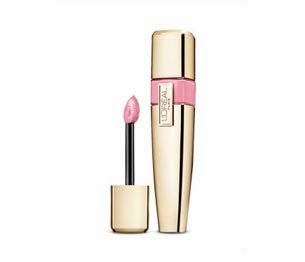 In late 2012, L’Oreal came out with Color Caresse Shine Stain. This lip stain comes in 12 different shades that are very pleasing to the eye. These shades boast a 4-5 hour staying power that does not travel while eating or drinking, doesn’t dry your lips out, settle into the fine lines or fade unnaturally. Just like YSL it comes in a very attractive bottle with a very similar lip wand. L’Oreal’s lip stain measures at 0.21z and retails for anywhere between $7-$10 dollars a bottle. A total steal! 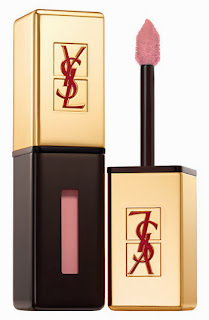 Now, here is the catch….YSL and L’Oreal’s lip stains are basically the same formula. They are what is considered in the makeup world a dupe of each other. So if you want to spend $34-$36 dollars on YSL, then go right ahead. Just know that for a lot less, you can get the same exact lip stain from L’Oreal. Granted, YSL has more shades (40) than L’Oreal (12) so if YSL is out of your price range, keep in mind that L’Oreal boast the same lip stain for less than half the price. After brushing your teeth, brush your lips with your tooth brush to get rid of any dry and dead skin cells. If you have dry lips, then sadly any lip stain will reflect it. Dry your mouth before applying lip stain and DON’T wear lip balm underneath it. In order for the lip stain to work, your lips must be dry and clean for the formula to stain your lips. Both YSL and L’Oreal take about 1 minute to set. So don’t touch your lips, add lip balm drink or eat anything or keep pressing your lips together during that time. If you want the lip stain to look darker then apply 2-3 coats in order to get that darker effect. Lastly if you want to add lip balm because your lips feel dry, and then add it on AFTER the lip stain has dried so that you don’t disturbed the setting process.